Face Art Glitter Temporary Tattoos Instant Makeup-DAY of the DEAD SUGAR SKULL-DIA de los MUERTOS-Halloween Cosplay Colorful Stick on Eye Wear Fake Tattoo Decals. Eye Shadow Sequin Decor Sticker Transfers. Special Effects Cosmetic Accessory, as pictured. Easy application and removal. Peel-and-Place, No water needed. DAY of the DEAD SUGAR SKULL-DIA de los MUERTOS-Colorful Stick on Eye Wear Glitter Sequin Tattoo Decals with Classic Detail. 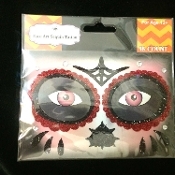 Halloween Cosplay Eye Shadow Face Art Sticker. Temporary Tattoos Transfers with Faux Rhinestone Gems Makeup Special Effects Cosmetic Accessory, as pictured. Easy application and removal. Peel-and-Place, no water needed!